Creating these little dumplings is a true art in China, where chefs spend years perfecting their craft. 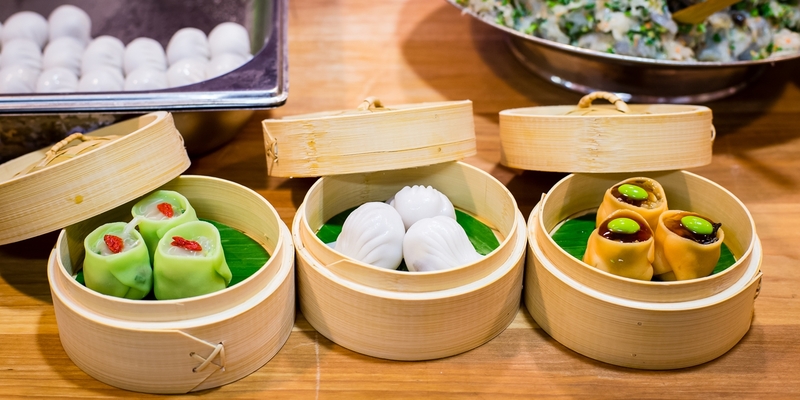 Dim sum literally translates to ‘touch the heart’, and they are traditionally eaten alongside tea. They can be cooked in a steamer, fried or roasted, and often contain a mixture of pork and prawns – although there are many different varieties. Har gau is one of the most popular varieties of dim sum, and Tong Chee Hwee’s recipe stays true to tradition. Scallop siu mai is another favourite, and looks incredibly impressive when done right. If you’re after a vegetarian option, then Jeremy Pang’s Shiitake chive dumplings with dipping sauce easily stand up against a meaty alternative, while Nisha Thomas’ Pork and chive dumplings are great for the beginner who wants to perfect their wrapping skills. Remember, creating these dim sum recipes is quite tricky, so if at first your dumplings look a bit haphazard, don’t fret. Practice makes perfect and once you get to the stage where your siu mai look like they’ve come straight out of Chinatown, you can give yourself a thoroughly deserved pat on the back as you’ve cracked one of the toughest elements of Chinese cooking.